Like many places throughout the East Coast (and the mid-west, too), we’ve been hit with some pretty cold days this past week. It was 4 degrees this morning when I woke up, and that’s not factoring in windchill. Being from Ohio originally, winter weather doesn’t usually bother me. The days that people say are a bit chilly here tend to feel like a fall day in Ohio, most of the time. But I’ll admit that 4 degrees feels a little excessive on the cold end. which helped to insulate a very little bit, even as it made the place hell for anyone with allergies. In an attempt to make the place a tad bit warmer, I went ahead and put some plexiglass and blankets in front of the downstairs fireplace. Raven has been having fun exploring it, as you can see. By the way, you’re getting a tiny little sneak peek of the basement in this shot. Hopefully, I’ll have more pictures up soon. While Raven’s usually plenty willing to cuddle up to me on the couch in the chilly basement, Alvin tends to prefer warmer spots in the house. He’s slept back on one of the beds the past couple nights, and a lot of time is spent snoozing while cuddled up on this pillow, on the back of the couch. I find it a little irritating, but certainly true to the fickle nature of cats, that neither cat will even sit on the fuzzy cat beds I bought for them the day I brought them home, but Alvin has no problem taking over this pillow. That pillow, by the way, is my pillow. 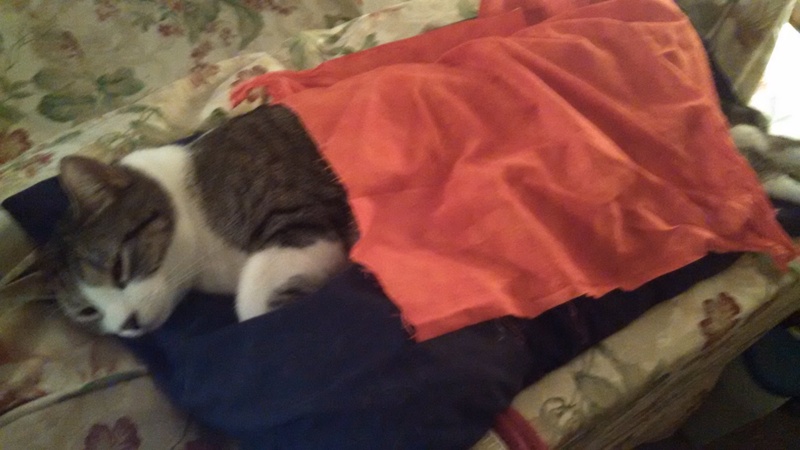 I bought it to use it as a camping pillow and the darn cat has taken it over. It’s covered in Alvin hair. Usually, Alvin doesn’t like being covered up by things, but he didn’t protest when I put this on him last night. I guess that means that even he is bothered by the chilly temperatures. 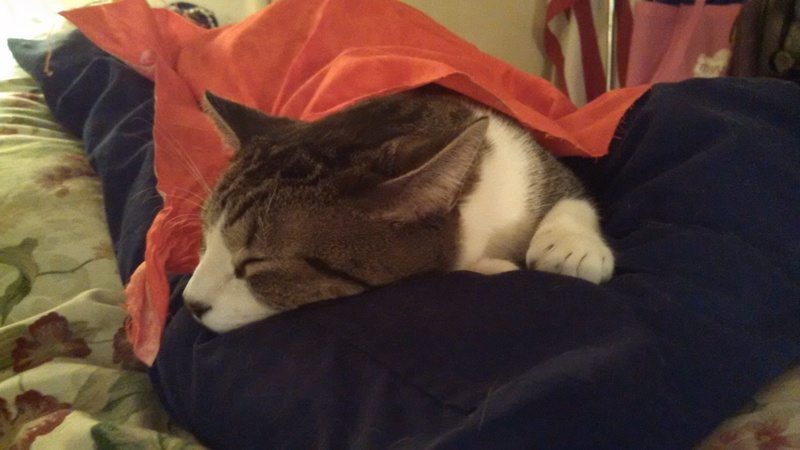 Either that, or he knows how adorable he looks when he’s snoozing on a pillow, under a cat-sized sheet. 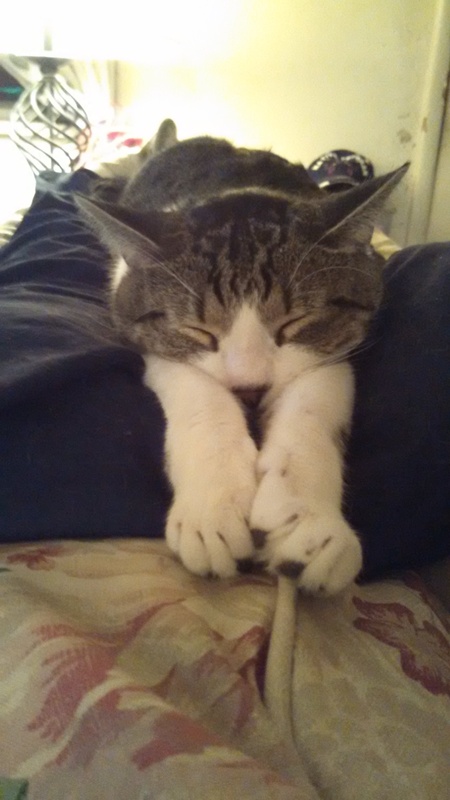 I maintain that he always knows that he looks adorable. That’s how he gets away with as much as he does.